The disk of dust and gas accreting around a 300 million solar-mass black hole in NGC 7052. The existence of black holes has been theorised for more than 200 years. It is impossible to observe them directly, and astronomers had no way to test their theories until Hubble arrived. The high resolution of Hubble made it possible to see the effects of the gravitational attraction of some of these objects on their surroundings. Hubble has also proved that super massive black holes are most likely present at the centres of most, if not all, large galaxies. This has important implications for the theories of galaxy formation and evolution. Black holes exist in different sizes. Stellar black holes, which are around the mass of our Sun, form when very large stars explode as supernovae at the end of their lives. The star's core collapses as the outer layers are blown away, leaving a small but extremely dense ball. Supermassive black holes, many millions of times the mass of our Sun, are of more mysterious origin, and are found at the centre of galaxies. It is in the study of super massive black holes that Hubble has made its biggest contribution. Quasar PG 0052+251 and its host galaxy. Before Hubble, quasars were considered to be isolated star-like objects of a mysterious nature. Hubble has observed several quasars and found that they all reside at galactic centres. Today most scientists believe that super massive black holes at the galactic centres are the "engines" that power the quasars. Prior to the launch of Hubble a handful of black hole candidates had been studied but the limitations of ground based astronomy were such that irrefutable evidence for their existence could not be obtained. Black holes themselves, by definition, cannot be observed, since no light can escape from them. However, astronomers can study the effects of black holes on their surroundings. These include powerful jets of electrons that travel huge distances, many thousands of light years from the centres of the galaxies. 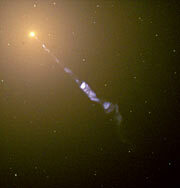 A stream of electrons ejected from the centre of galaxy M 87. Matter falling towards a black hole can also be seen emitting bright light and if the speed of this falling matter can be measured, it is possible to determine the mass of the black hole itself. This is not an easy task and it requires the extraordinary capabilities of Hubble to carry out these sophisticated measurements. The disk around the black hole at the centre of galaxy NGC 7052. 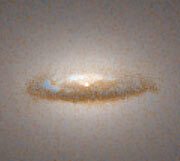 Hubble observations have been fundamental in the study of the jets and discs of matter around a number of black holes. Accurate measurements of the masses have been possible for the first time. Hubble has found black holes 3 billion times as massive as our Sun at the centre of some galaxies. While this might have been expected, Hubble has surprised everyone by providing strong evidence that black holes exist at the centres of all large galaxies and even small galaxies. Hubble also managed not only to observe the jets created by black holes but also the glowing discs of material surrounding a supermassive black hole. One big question which remains is why most galaxies in our cosmic neighbourhood, including the Milky Way, appear to have a dormant black hole which is not funnelling in large amounts of matter at present. Today most astronomers believe that quasars, radio galaxies and the centres of so-called active galaxies just are different views of more or less the same phenomenon: a black hole with energetic jets beaming out from two sides. When the beam is directed towards us we see the bright lighthouse of a quasar. 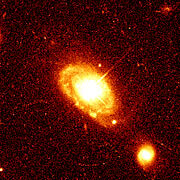 When the orientation of the system is different we observe it as an active galaxy or a radio galaxy. This ‘unified model’ has gained considerable support through a number of Hubble observational programs. The simplistic early ideas have however been replaced by a more complex view of this phenomenon – a view that will continue to evolve in the years to come.